My housemate begged me to teach her how to make cauliflower gratin. My mum had made it as a side dish for a roast we had had a few months ago. “But I’ve got the craving for it now,” she said. I must admit that I had never really thought of this dish as a substantive main meal. I mean, I always loved it paired with roast lamb and drizzled with gravy. But on its own? Why not. People eat mac and cheese as a dish and this is pretty much the same except – shock horror – it has VEGETABLES in it. Well, one vegetable anyway. And a cheap one when you can buy it in season. This week it is on special for only $1.99 each at ALDI. When I got to my local ALDI there were hardly any left, probably a sign of there being many cupboard cauliflower lovers out there. I made too much white sauce – it depends a bit on the size of your cauliflower as to whether it will all soak up or not. But it worked out more than fine as I used the leftovers to make a few mini mac and cheese for Little A. So in effect I got two meals out of this one. Wash the cauliflower, cut into florets and wash. Then boil in a large saucepan until tender. Meanwhile, make the sauce. Ideally heat the milk – I usually put in a glass jug and then heat in the microwave for around one minute until warm. In a large heavy based saucepan, melt the butter until bubbling. Add the flour, then stir with a wooden spoon. Allow to cook for a few minutes. Take off the heat, then gradually add the milk, stirring continuously with the wooden spoon. Season with salt, pepper and nutmeg. The nutmeg is my secret ingredient. White pepper is best as the sauce keeps its nice white colour, but black tastes just as good. Continue to stir with the wooden spoon until the sauce thickens. Do not allow it to boil. Do not leave it unattended or you risk a lumpy sauce. Once it has thickened, take off the heat then add in half the cheese and stir until it is melted. Drain the cauliflower and pour it into the white sauce mixture. Stir until combined, then spoon the entire mixture into a large baking dish. Cover with more grated cheddar cheese and some homemade breadcrumbs (if you have them). Cover with some aluminium foil and bake at around 150/160C for around 20 minutes. Take the foil off the bake and then cook until golden. Serve at once as is or with a salad. Serina, I love the taste of cauliflower but unfortunately it doesn’t like me (well let’s just say it ‘clears the air’ so to speak). 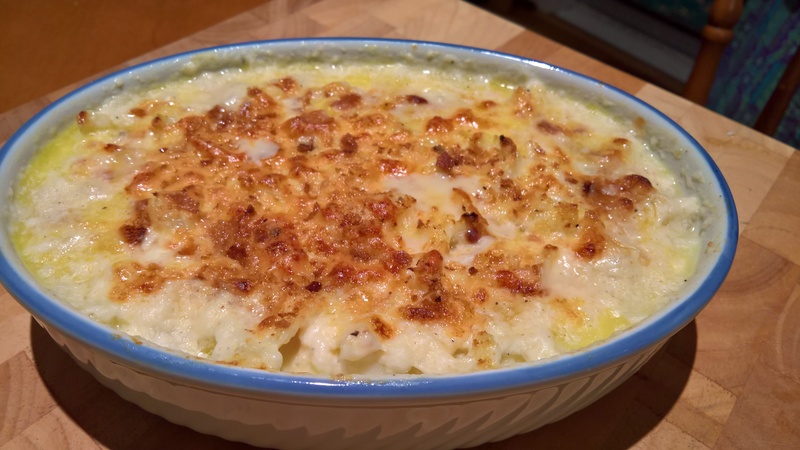 I wonder if this gratin would work with broccoli just as well? 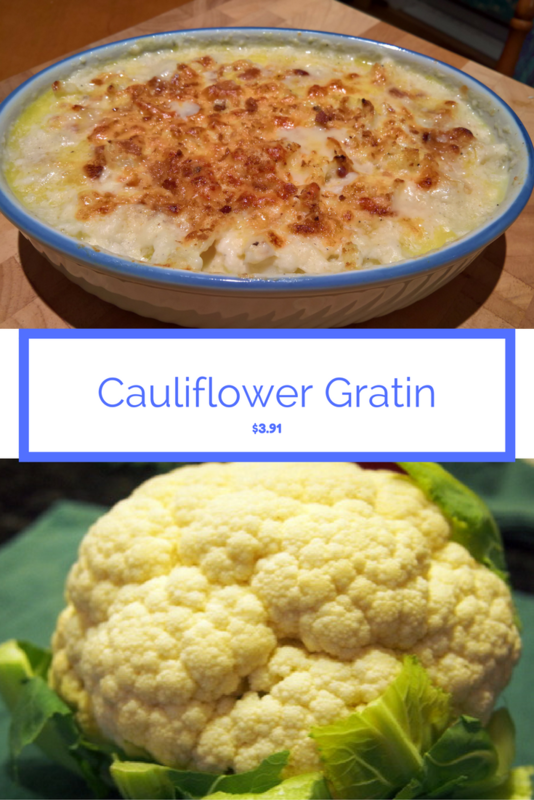 Cauliflower and cheese just make so much sense together. Yum! Yum! I love cauliflower and this sounds like a tasty dish, especially with Fall just around the corner. Sounds amazing. I love sneaking in veggies whenever I can. And for me, there’s no such thing as too much cheese! Love cauliflower and I tend to use them to replace mashed potatoes. This sounds like a delicious twist on one of my fav vegetables. How simple too!! Will try this instead, the next time I make cauliflower. Yum! I haven’t tried cauliflower mash. Something good to try. This is a simple and easy enough dish to make, love the use of nutmeg! Nutmeg is wonderful, isn’t it? So underused and misunderstood. It is powerful and a little goes a long way.